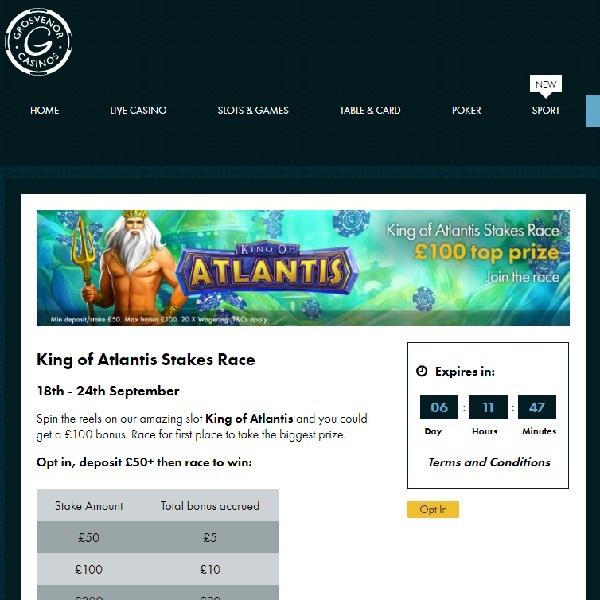 This week Grosvenor Casino is running a King of Atlantis Stakes Race and you could get a bonus of up to £100. All you have to do to is opt in and then deposit at least £50. Then start playing the slot and the more you bet on it the bigger your bonus reward will be. If you bet £50 or more you’ll get a £5 bonus, bet £100 for a £10 bonus, £200 for a £20 bonus, £500 for a £50 bonus and £1,000 for a £100 bonus. The bonus money can be used on the King of Atlantis slot game. It is an exciting slot packed with features and the chance to win payouts of up to 250x so you could win a huge amount of money. Visit Grosvenor Casino this week for your chance to receive a huge bonus.